We recommend skimming over the abstracts and figures in these resources, then come back are read those that seem to be more useful in more detail. Also, we can send a longer reading list to interested parties; email us if interested. 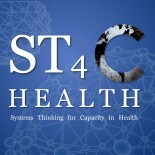 Systems Thinking and Health Systems Strengthening: A Novel Opportunity for Synergy: A 107-page book published by the Alliance for Health Policy and Systems Research that provides a great overview of systems thinking and its potential in global health. Systems Thinking for Health Systems Strengthening in LMICs: Seizing the Opportunity: A supplement published in October 2012 by Health Policy and Planning that provides in-depth case studies and conceptual considerations of systems thinking and health. Capacity development: between planned interventions and emergent processes Implications for development cooperation: A short (5 pages) introduction to complexity and implications for capacity enhancement. The more lengthy consideration (over 150 pages) can be found here. From silos to systems: Dealing with population health challenges in the world today: siloed approaches ignore systems level effects. Systems thinking is needed to improve population health. BMJ Series on Complexity and Healthcare: explores the complexity of today’s healthcare systems and innovative strategies in health education, leadership, and policy. American Journal of Public Health Series on Systems Thinking in Public Health: This series explores the successes, challenges, and potential of systems thinking applications in public health. Health Education and Behavior series titled ‘Systems Science Application in Health Promotion and Public Health’: This series discusses the application of systems sciences to current public health and health promotion issues. Social Science & Medicine series titled ‘Complexity in Health and Health Care Systems’: This series explores the complexity of health and current health care systems. The series begins with article 24 and continues through article 32. Health Research Policy and Systems series titled ‘Advancing the application of systems thinking in health’: This series concentrates on actual applications and experiences of systems thinking in health. Health Policy and Planning series titled ‘Systems thinking for health systems strengthening in LMICs’: seizing the opportunity’: This series addresses the untapped potential of systems thinking in low- and middle-income countries. BMC Public Health supplement entitled ‘Navigating complexity in public health research’: The supplement presents research on complex adaptive systems, focusing on research in women’s health in culturally diverse, contemporary Australian society.